A new adhesive from 3M (Maplewood, MN) is made to bond bare metals, resist corrosion and withstand extreme temperatures, according to the manufacturer. 3M Scotch-Weld Metal Bonder Acrylic Adhesive DP8407NS Gray is a high-strength, fast-curing adhesive that, the company says, maintains its strength down to -40 degrees Fahrenheit. 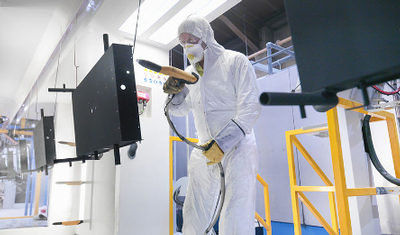 It can also withstand heat up to 400 degrees Fahrenheit for up to an hour, making it compatible with powder-coating or paint baking processes, 3M says. 3M recommends Scotch-Weld Metal Bonder for applications including architectural panels, metal fabrication, specialty vehicle, appliances and furniture. The new product can bond various metals without a great deal of surface preparation, the company says. 3M recommends it for applications including architectural panels, metal fabrication, specialty vehicle, appliances and furniture. In addition to metals like aluminum, steel, copper, brass and bronze, the company notes that the adhesive bonds plastics and composites. The Scotch-Weld adhesive is designed with high impact strength and vibration resistance, 3M says, and is formulated to stave off corrosion. It can be applied with a Scotch-Weld EPX Manual Applicator, and, the company notes, bonds well even with oily metal. The product has an 18-month shelf life at room temperature, according to product materials. 3M Scotch-Weld Metal Bonder Acrylic Adhesive DP8407NS Gray comes in 45-ml and 490-ml cartridges, as well as 1-gallon and 5-gallon buckets and 55-gallon drums.